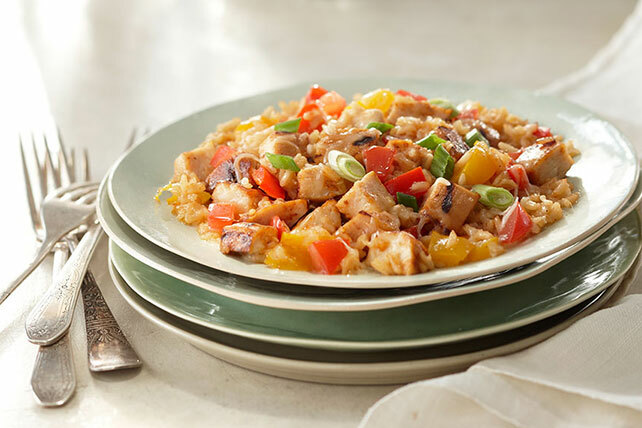 Put your leftovers to good use with our Summer Vegetable Skillet with Chicken. This summer vegetable skillet makes the most out of your ingredients. Heat oil in large skillet on medium-high heat. Add peppers; cook 7 min., stirring occasionally. Stir in garlic; cook 1 min. Add rice, water and barbecue sauce; stir. Bring to boil, stirring occasionally. Top with Easy Grilled Chicken Breasts, tomatoes and cheese; cover. Simmer on medium-low heat 10 min. or until rice is tender and cheese is melted. Prepare using instant brown rice and KRAFT 2% Milk Shredded Italian* Three Cheese Blend. Serve topped with toasted pine nuts or 1/4 cup sliced fresh basil. Marinate 8 small boneless skinless chicken breasts (2 lb.) in 1/4 cup KRAFT Original Barbecue Sauce in refrigerator 1 hour. Remove chicken from marinade; discard marinade. Grill chicken on medium heat 5 to 7 min. on each side or until done (165°F), brushing occasionally with 1/4 cup additional barbecue sauce for the last few minutes. Use 4 chicken breasts to prepare this recipe, then refrigerate remaining chicken breasts for another meal.